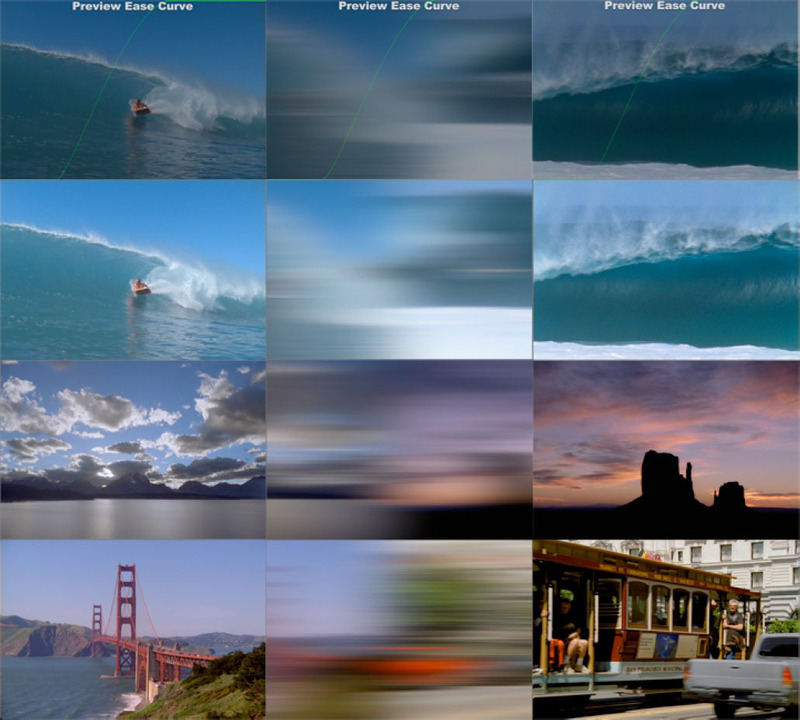 This transition filter enables you to create fast camera-pan style transitions between clips. The filter is fully automated in some NLE host environments, such as Avid or Apple, and also includes full manual override controls. Like all of the other filters that are included in the transition category of effects in BCC 6, the Swish Pan filter includes user controls for the velocity of the pan with on-screen display of the ease-in and ease-out curve. Layer to Reveal pop-up: Sets the clip to be used as the incoming media for the transition effect. Use Colored Background: Whether or not the result is composited over a solid background color or whether instead any transparency introduced by the Separation control is allowed to remain in place. Background Color: Controls the color of the solid background when Use Colored background is enabled. Blur: Controls the peak amount of blurring at the midpoint of the transition. Separation: Controls the amount by which the two clips (incoming and outgoing) overlap. Contains additional controls for fine-tuning the blur effect. Blur Delay: Positive values cause the transition to start and end unblurred, and delay the blur effect until after the transition has started. Negative values cause the blur to start at the beginning of the transition, and delay the pan. Motion Blur: Amount of blur in the direction of motion of the pan. Clip Motion Blur: Clips the blur to the slider value taken as a percentage. This causes the effect to reach it’s maximum blur value partway through the effect and hold it. (e.g. At the default settings, the maximum blur is 50 units. The effect reaches maximum blur 1/4 of the way through the effect, and holds the max blur until 3/4 of the way through. If clip Motion blur were set to 100, the blur would reach 100 units halfway through. Perpendicular Blur: An optional blur normal to the direction of motion of the pan. Blur Apply Mode pop-up: Contains 27 apply modes for compositing the blur effect. Blur Apply Mix: Blends the selected apply mode with the Normal apply mode.